Tray. 1950s. 15 3/4 x 12 "
45 x 30 cm. Very good condition. Bottom a little worn (under). Metal tray. Sweden. FELIX sandwich tray. 1970s. Diam. 13½". 34 cm. A few scratches, but still in better than good condition. 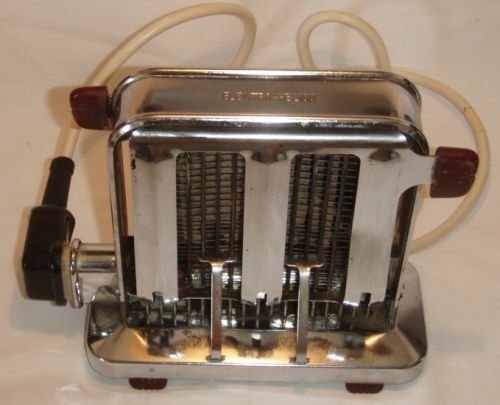 Swedish toaster from the 50s. ElektroHelios. 220-240 W.
Very, very good working condition. Net cable comes with it. $ 20.00. Small flatware, with teak handles. Thick (heavy) metal. Mint in cover. Plastic tray. Finland. 1970s. Yellow. Length: 6 7/8, 17,5 cm. Length: 7 3/8, 19 cm.